For those of us old enough to remember when abortion was "just a Catholic issue," and wonder how America turned into an extremist nation, George M. Marsden's article at Salon.com, "Reagan’s Christian Revolt: How Conservatives Hijacked American Religion,"explains how and he starts off by noting that, "Once upon a time, America's religious communities were politically moderate. Then along came the evangelicals:"
"As late as 1976, the political sensibilities of revivalist evangelicals were still unformed when many of them voted Democratic for Jimmy Carter, largely on the basis that he had declared himself 'born again.' Prior to 1976, 'born again' was not a familiar phrase in mainstream public discourse. Moreover, the term 'evangelical' was seldom used, at least not in connection to politics. When Newsweek declared 1976 to be 'The Year of the Evangelical,' the publicity helped to create a sense of potential among evangelicals, who began to think of themselves as a political force. Conservative evangelical and Catholic leaders, however, soon became disillusioned with President Carter. He supported the Equal Rights Amendment, he did not take a stand against abortion, and he was friendly to the Democratic Party agenda to guarantee rights for homosexuals and to broaden the definition of the family. In that context, in 1979 fundamentalist Jerry Falwell founded the Moral Majority, a political-action organization to mobilize religious conservatives. Revivalist evangelicalism had suddenly emerged as a conspicuous player in national politics. "The government was not, of course, the only force in furthering the sexual revolution. 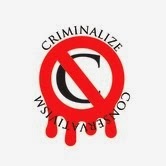 Rather, the courts and governmental agencies were responding to much larger social trends and agendas that were energized by vigorous movements and lobbies and supported by most of the media and the intellectual community. The mainstream media and commercial interests often supported the new permissiveness. Nonetheless, for those alarmed by the sexual revolution, the government’s role in permitting and promoting it was sufficient to provoke a political response, even among evangelicals who traditionally had warned against political involvements. "One of the factors evident in the support for Ronald Reagan in 1980 was nostalgia for the 1950s. Many conservative Americans had been alarmed by the cultural changes unleashed by the counterculture and antiwar movements of the 1960s and felt that something essential about the culture was fast slipping away. Reagan himself cultivated his image as a champion of traditional values. Just one of many examples was a 'Morning in America' series of TV ads in his 1984 campaign depicting the small-town America of more peaceful and ordered days. Unquestionably, Reagan’s staunch anticommunism also evoked an image of the 1950s, a time when Americans were proud to be united by their flag-waving patriotism. Newly politicized revivalist evangelicals were no doubt attracted by this nostalgia, as were many other Republican voters, but they added their own variation on the theme. They were not simply proposing to bring America back to a time when traditional family values, respect for authority, and unquestioning love of nation were intact. Rather, they were blending such Reaganesque images with something more basic: America, they said, needed to return to its 'Christian foundations.' And understanding what revivalist evangelicals had in mind by such rhetoric is one key to understanding the cultural wars and revivalist evangelicalism’s part in them. "Part of Schaeffer’s appeal was that he repeatedly reminded his audiences that the loss of what he called America’s 'Christian consensus' had taken place only within living memory. 'It is a horrible thing,' he wrote in his final book, 'The Great Evangelical Disaster,' published in 1984, 'for a man like myself to see my country and my culture go down the drain in my lifetime.' He remembered a time when the Christian consensus still prevailed. By a 'Christian consensus,' he did not mean that everybody was Christian, but rather, that 'the Christian worldview, and biblical knowledge in particular, were widely disseminated throughout the culture and were a decisive influence in giving shape to the culture.' Such outlooks were characteristic, he said, of 'Reformation countries and in our own country until the last forty to sixty years,' when 'most people believed these things—albeit sometimes only in a vague way.' Schaeffer’s audiences, at least in many regions of the country, especially across the South and in some areas of the Midwest, may have recalled the 1950s as the sort of time he was evoking, when evangelical Christianity was virtually the default religion. Schaeffer himself was from the Northeast, where the changes had come earlier; in the 1950s, he had already been a separatist fundamentalist attacking the mainstream culture and its churches. So he set the date of the end of the Christian consensus further back, to the 1930s. "Francis Schaeffer, of course, does not represent the whole of the religious right—he had, for instance, little connection with the important conservative Catholic part of the movement—but his outlook serves to illustrate some significant dimensions of the fundamentalistic evangelical wing of that movement. Viewed in relation to the mainstream American outlooks of the 1950s, one feature of the movement was its strong reaction against pragmatic liberalism, which it now understood in Schaeffer’s framework as part of the 'secular humanism' that had led to the moral relativism evident in America since the late 1960s. Schaeffer added the motif, reminiscent of Erich Fromm, that if a society lost its moral moorings, totalitarianism would fill the vacuum. So pragmatic liberalism, which to its proponents in the 1950s seemed the best defense against ideological extremes, now could be seen as opening the door to totalitarianism. Even if Communists were rare on the home front in the 1980s, secular humanists were everywhere, and only a stance of cultural warfare could stop their destruction of American liberties. Schaeffer repeatedly called for reestablishing a Christian consensus, but ironically, 'consensus' had become a fighting word. He depicted the cultural crises in the most urgent terms as he issued calls to arms. So he wrote in 1982 with typical hyperbole in a foreword to his associate John Whitehead’s 'The Second American Revolution': 'If there is still an entity known as "the Christian church" by the end of the century, operating with any semblance of liberty . . . it will probably have John Whitehead and his book to thank.' The book, he went on, 'lays the foundation and framework for fighting the tyrannical, secularist, humanistic power.' Like the early American patriots, Christians would have to be ready to fight for their liberties. Restoring America’s 'Christian base' would require enlisting in America’s culture wars. "Granting that there were and are many highly significant issues involved in these political concerns that deserve consideration on their merits, it is also important to recognize that once the matters are framed in terms of warfare and simple either-or choices it becomes virtually impossible to negotiate those issues in a pluralistic society. That is especially the case when the issues are framed in terms of returning America to its Christian roots, as is standard fare in the outlooks of the fundamentalist-evangelical political right. Partly the problem is rhetorical. Typically, evangelicals speak of their views as shaped by 'the Bible alone.' The more fundamentalistic or militant they are, the more they divide reality into simple dichotomies, such as 'Christian' and 'non-Christian.' That leaves little room for making other distinctions. So when they talk about reinstituting America’s Christian basis, it sounds as though they are proposing a return to something like the early New England Puritan order of the 1600s, when the government was based on explicitly biblical principles, and discrimination against non-Christians was taken for granted. "Fundamentalists and evangelicals of the religious right often have difficulty recognizing their own mix of biblical and more secular principles because they typically use only two categories in their analyses: Christian and non-Christian. That limitation can be best illustrated in the outpouring of books in recent decades claiming to prove that the founding fathers were Christians. In their own ministries, the authors of these books insist that only the 'born again' will enter the kingdom of heaven. 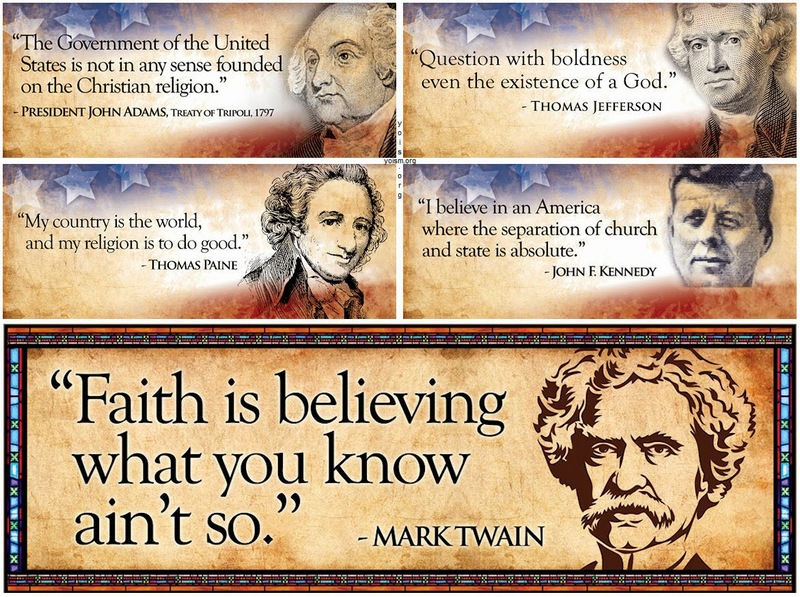 Yet when it comes to the nation’s founders, most of whom were not orthodox evangelical Christians, these very conservative biblicists end up endorsing a remarkably broad definition of 'Christian.' Perhaps the most telling of the many examples that could be cited is that in 2012, David Barton, the most popular and influential writer on America’s Christian origins, published a book celebrating Thomas Jefferson’s faith. 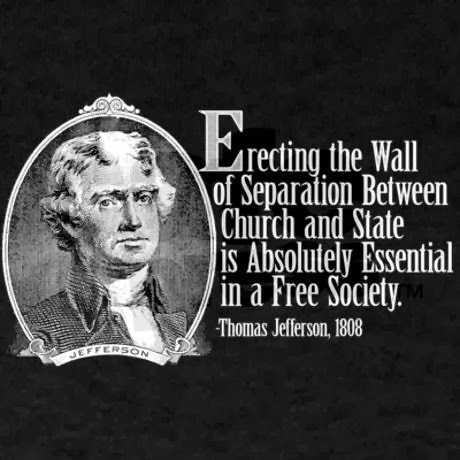 The fact of the matter is that Jefferson was openly and sometimes militantly anti-orthodox and anti-evangelical. During the election of 1800, many orthodox Protestants strongly opposed him for his unconventional religious views. Barton’s zeal to claim Jefferson as a Christian believer led to so many distortions that, when these were documented, his publisher, Thomas Nelson, ceased publication. "Francis Schaeffer, who recognized the unorthodoxy of most of the founders, tried to solve the problem by attributing their views regarding rights and freedom to the Reformation. 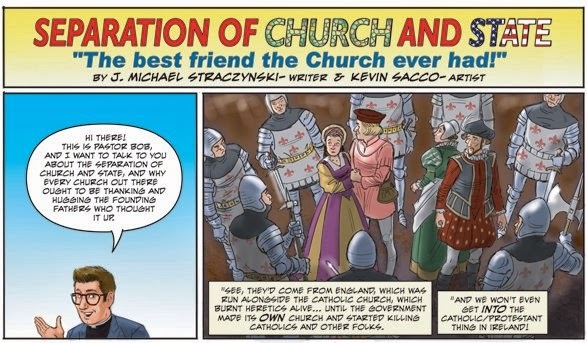 In fact, though, the early Protestant governments of the Reformation period were not concerned about protecting liberties in the same way that the founders later were in the American republic. Those ideals developed in the British enlightenment in the seventeenth and eighteenth centuries. They did have a discernibly Protestant lineage, such as in concerns about the sanctity of conscience, but the founders’ ideals were also shaped by factors beyond the Protestant principle of 'the Bible alone.' These influences included classical political principles, classical and Christian natural-law traditions, modern scientific empiricism, the growing trust in the authority of common rationality, emerging ideals that individuals should be self-determining, and practical self-interested concern regarding political and economic freedoms. It is one thing to say that some versions of the resulting mix were 'Christian,' in the sense of being compatible with biblical or church teachings. Yet, historically speaking, the actual mix was far from being simply Christian or Protestant, even if it included significant Christian elements. "The complex heritage of the evangelical religious right, as shaped, among other things, both by biblicist bornagain revivalism and broader principles developed during the eighteenth-century American enlightenment, helps to explain some of its paradoxes, apparent contradictions, and blind spots. The biblicist side is often absolutist and militant, invoking stark choices between serving the Lord of Hosts or the Baal of secular humanism. The enlightenment heritage allows militantly conservative fundamentalists to in fact affiliate with the wide coalition represented in the Republican Party and to participate in the give-and-take of practical politics, despite all the compromises that inevitably requires. In the strict biblicist view, the American nation can be seen as having forfeited any claim to God’s blessings and as being under judgment for its open sins, so that the only hope is to trust in Jesus to return to set things right. But the enlightenment heritage tells the evangelical religious right that the American principles of civil freedom, self-determination, and free enterprise are the best there are, and that evangelicals can therefore unreservedly embrace the American civil religion and condemn anyone who questions that America has a special place in God’s plan. The strictly biblicist heritage fosters a rhetoric that sounds theocratic and culturally imperialist, and in which a Christian consensus would seem to allow little room for secularists or their rights. The enlightenment heritage means that the leading motif in their politics is the necessity of protecting freedoms, especially the personal and economic freedoms of the classically liberal tradition. So when members of the evangelical religious right speaks about returning to a 'Christian' America, they may sound as though they would return to days of the early Puritans; yet, practically speaking, the ideal they are invoking is tempered by the American enlightenment and is reminiscent of the days of the informal Protestant establishment, when Christianity was respected, but most of the culture operated on more secular terms. "Even though the populist religious right is marked by paradoxical features, it should also be given credit for drawing attention to important questions about the role of religion in American public life. After the decline of the mainline Protestant establishment, the society was left with no real provision as to how religious viewpoints would be represented in the public sphere, such as in politics or education. At the same time, an immense revolution in mores had been accelerated by the upheavals of the late 1960s. Many prevailing moral standards promoted in popular culture, in commercial culture, by the government, and in public education were at odds with the traditional religious teachings not only of conservative Protestants but also of many of the other traditionalist religious groups across the country. An important question was how such conservative religious viewpoints, which were largely minority viewpoints, might be represented and protected in the public domain. 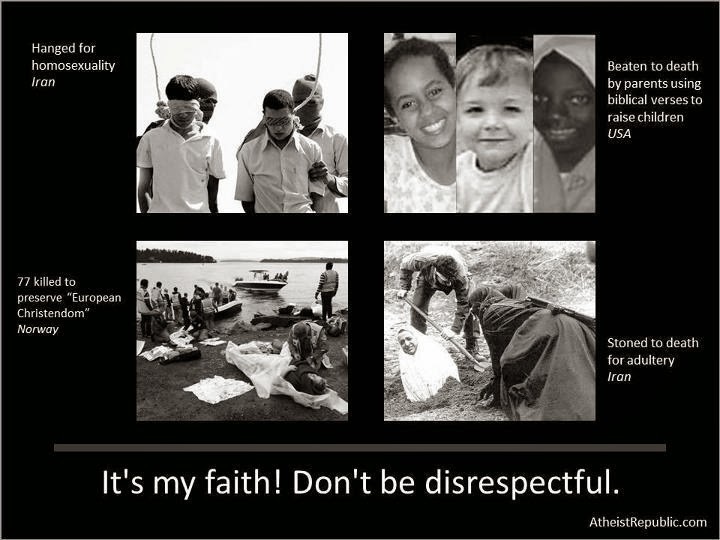 Advocates of the religious right were rightly concerned to guard their own freedoms of religious expression and action. Yet they seldom had a theory of how to do the same unto others as they would have done unto themselves—that is, they rarely spoke of how to provide equal protection for religious and secular viewpoints with which they did not agree." After Schaeffer hijacked the Authoritarian concept as well as Erich Fromm's writings on totalitarianism - two concepts that liberals had previously branded Conservatives with - and applied it to the Conservative fundamentalist evangelical wing, all that was needed was the election of a mean, senile old man to the White House to start the country down the road to secular heaven. 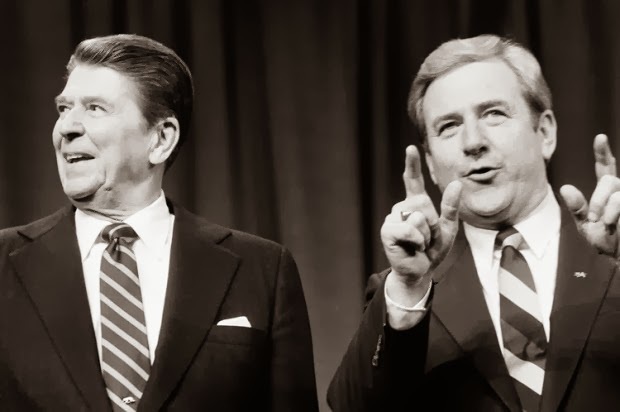 As the piece notes, "...the election of Ronald Reagan in 1980 might represent a window of opportunity to reassert Christian values," and the rest is not only history but a flash back to the Middle Ages. The paragraph that stood out for us was, "Even though the rhetoric sounds authoritarian, as though the nation would be redefined as exclusively Christian and its law would be based on the Bible, the vast majority of fundamentalists and evangelicals of the religious right were—and are—in fact committed to religious liberty," and we find it a little misleading without reading the whole excerpt. 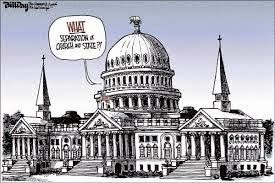 If the Bible thumpers views are derived from "the Bible alone," they have no room in a democratic society based on the Separation of Church and State. And if, as Schaeffer says, "...we are at war, and there are no neutral parties in the struggle," then it is high time that we finish that war, by criminalizing Conservatism, taxing the churches, banning public "worship," and thus squelching all the false issues that the Conservatives come up with, including the abortion issue, states' rights, individual liberty, and all of the other hot buttons that set the Sheeplets groins on fire. George W. Bush to Brazilian President Fernando Henrique Cardoso.